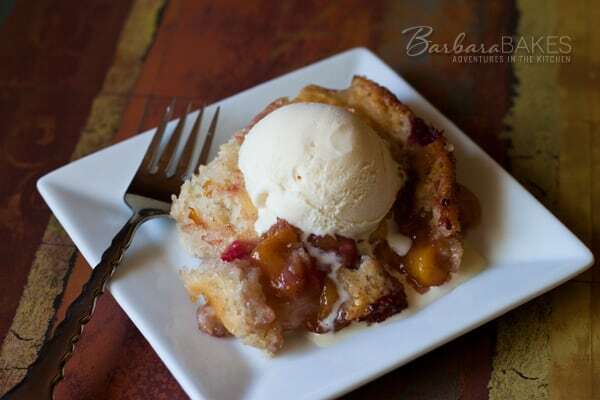 Peach cobbler is a popular southern dessert. My version is loaded with sweet peaches and tart raspberries then topped with a sweet, buttery cake-like topping. 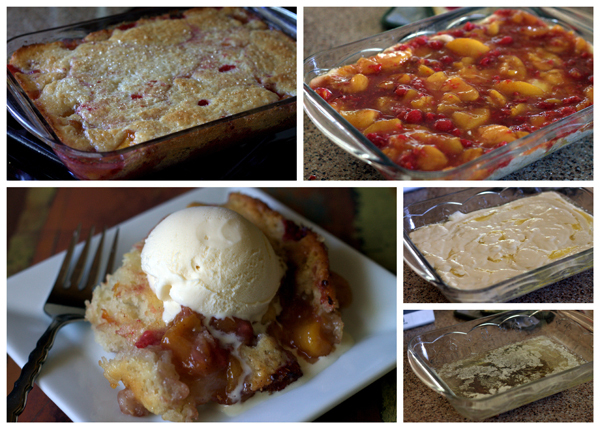 On Monday I posted a tutorial on how to slice peaches and promised you a peach cobber recipe. I had a request from a reader to post a peach cobbler recipe with measurements by weight as well as cups. I know it’s frustrating for many readers not having the conversions for each recipe and maybe one day, I can offer that on all my recipes. Until then, Aletta, this cobbler recipe’s for you. My husband’s not a big fan of biscuit type toppings on cobblers, so I looked for a recipe that had a more cake like top. This recipe is adapted from a highly rated Paula Dean recipe on the Food Network. My husband raved about it too. I made quite a few changes, including reducing the butter and sugar. I added raspberries, to add a little tartness to the sweet peach filling, and crowned it with some turbinado sugar so the top would also have a little crunch. Of course I had to serve it ala mode. I love the creamy ice cream melting in to the hot fruit. So good! Whisk together 1/2 cup sugar, cinnamon, and cornstarch in large microwave-safe bowl. Stir in water and peaches. Microwave on high, stirring occassionally, for 6-8 minutes or until the peaches have softened and liquid has thickened. Remove from microwave and stir in raspberries. Put the butter in a 9x13 baking dish and place in oven to melt. Whisk together 1 cup sugar, flour, baking powder, and salt. Gradually whisk in milk and vanilla. Pour mixture over melted butter. Gently spoon fruit mixture evenly on top of batter. Batter will rise to top during baking. Bake for 30 to 45 minutes until golden. Optional: After 25 minutes cook time, sprinkle turbinado sugar over the top of cobbler and continue cooking until golden. To serve, scoop onto a plate or bowl and serve with vanilla ice cream.